This guide describes how to configure the Ceph Metadata Server (MDS) and how to create, mount and work the Ceph File System (CephFS). This chapter explains what the Ceph File System (CephFS) is and how it works. The Ceph File System (CephFS) is a file system compatible with POSIX standards that provides a file access to a Ceph Storage Cluster. The CephFS requires at least one Metadata Server (MDS) daemon (ceph-mds) to run. 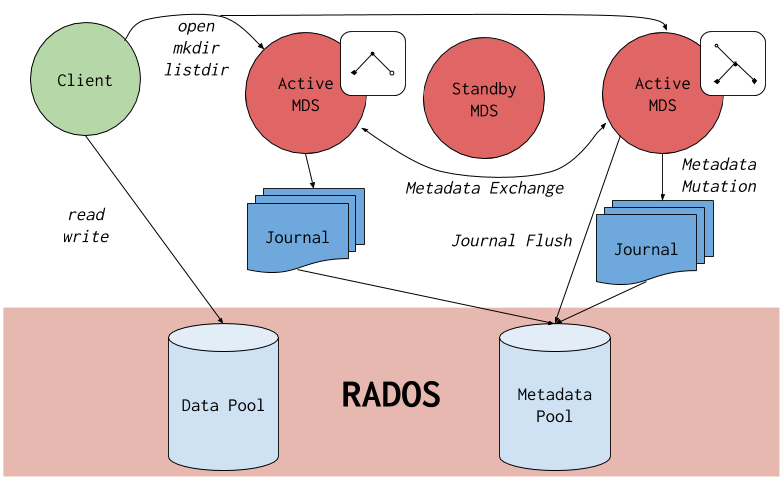 The MDS daemon manages metadata related to files stored on the Ceph File System and also coordinates access to the shared Ceph Storage Cluster. CephFS uses the POSIX semantics wherever possible. For example, in contrast to many other common network file systems like NFS, CephFS maintains strong cache coherency across clients. The goal is for processes using the file system to behave the same when they are on different hosts as when they are on the same host. However, in some cases, CephFS diverges from the strict POSIX semantics. For details, see Section 1.4, “Differences from POSIX Compliance in the Ceph File System”. This picture shows various layers of the Ceph File System. The Ceph Storage Cluster Protocol layer represents the Ceph native librados library for interacting with the core cluster. The CephFS library layer includes the CephFS libcephfs library that works on top of librados and represents the Ceph File System. The upper layer represents two types of clients that can access the Ceph File Systems. This picture shows in more detail how the Ceph File System components interact with each other. Clients represent the entities performing I/O operations on behalf of applications using CephFS (ceph-fuse for FUSE clients and kcephfs for kernel clients). Clients send metadata requests to active MDS. In return, the client learns of file metadata and can begin safely caching both metadata and file data. Metadata Servers serves metadata to clients, caches hot metadata to reduce requests to the backing metadata pool store, manages client caches to maintain cache coherency, replicates hot metadata between active MDS, and coalesces metadata mutations to a compact journal with regular flushes to the backing metadata pool. The Ceph File System is highly scalable due to horizontal scaling of metadata servers and direct client reads and writes with individual OSD nodes. The Ceph File System is a shared file system so multiple clients can work on the same file system at once. The Ceph File System provides a cluster of Ceph Metadata Servers (MDS). One is active and others are in standby mode. If the active MDS terminates unexpectedly, one of the standby MDS becomes active. As a result, client mounts continue working through a server failure. This behavior makes the Ceph File System highly available. In addition, you can configure multiple active metadata servers. See Section 2.6, “Configuring Multiple Active Metadata Server Daemons” for details. The Ceph File System allows users to configure file and directory layouts to use multiple pools, pool namespaces, and file striping modes across objects. See Section 4.4, “Working with File and Directory Layouts” for details. The Ceph File System supports the POSIX Access Control Lists (ACL). ACL are enabled by default with the Ceph File Systems mounted as kernel clients with kernel version kernel-3.10.0-327.18.2.el7. To use ACL with the Ceph File Systems mounted as FUSE clients, you must enabled them. See Section 1.3, “CephFS Limitations” for details. The Ceph File System FUSE client supports setting quotas on any directory in a system. The quota can restrict the number of bytes or the number of files stored beneath that point in the directory hierarchy. Client quotas are enabled by default. Then restart the Ceph client. Creating snapshots is not enabled by default because this feature is still experimental and it can cause the MDS or client nodes to terminate unexpectedly. Error EINVAL: Creation of multiple filesystems is disabled. Creating multiple Ceph File Systems in one cluster is not fully supported yet and can cause the MDS or client nodes to terminate unexpectedly. This section lists situations where the Ceph File System (CephFS) diverges from the strict POSIX semantics. If a client’s attempt to write a file fails, the write operations are not necessarily atomic. That is, the client might call the write() system call on a file opened with the O_SYNC flag with an 8MB buffer and then terminates unexpectedly and the write operation can be only partially applied. Almost all file systems, even local file systems, have this behavior. In situations when the write operations occur simultaneously, a write operation that exceeds object boundaries is not necessarily atomic. For example, writer A writes "aa|aa" and writer B writes "bb|bb" simultaneously (where "|" is the object boundary) and "aa|bb" is written rather than the proper "aa|aa" or "bb|bb". POSIX includes the telldir() and seekdir() system calls that allow you to obtain the current directory offset and seek back to it. Because CephFS can fragment directories at any time, it is difficult to return a stable integer offset for a directory. As such, calling the seekdir() system call to a non-zero offset might often work but is not guaranteed to do so. Calling seekdir() to offset 0 will always work. This is an equivalent to the rewinddir() system call. Sparse files propagate incorrectly to the st_blocks field of the stat() system call. Because CephFS does not explicitly track which parts of a file are allocated or written, the st_blocks field is always populated by the file size divided by the block size. This behavior causes utilities, such as du, to overestimate consumed space. When the mmap() system call maps a file into memory on multiple hosts, write operations are not coherently propagated to caches of other hosts. That is, if a page is cached on host A, and then updated on host B, host A page is not coherently invalidated. CephFS clients present a hidden .snap directory that is used to access, create, delete, and rename snapshots. Although this directory is excluded from the readdir() system call, any process that tries to create a file or directory with the same name returns an error. You can change the name of this hidden directory at mount time with the -o snapdirname=.<new_name> option or by using the client_snapdir configuration option. This chapter explains how to configure Ceph Metadata Server (MDS) daemons. To understand different states of MDS daemons, see Section 2.2, “States of Metadata Server Daemons”. To understand what a "rank" mean in MDS configuration, see Section 2.3, “Explanation of Ranks in Metadata Server Configuration”. To learn about various configuration types of standby MDS daemons, see Section 2.4, “Types of Standby Configuration”. To configure standby MDS daemons, see Section 2.5, “Configuring Standby Metadata Server Daemons”. To configure multiple active MDS daemons, see Section 2.6, “Configuring Multiple Active Metadata Server Daemons”. To decrease the number of active MDS daemons, see Section 2.7, “Decreasing the Number of Active MDS Daemons”. To learn about MDS cache size limits, see Section 2.8, “Understanding MDS Cache Size Limits”. Starting with Red Hat Ceph Storage 3.2, the ceph-mds and ceph-fuse daemons can run with SELinux in enforcing mode. Deploy a Ceph Storage Cluster if you do not have one. For details, see the Installation Guide for Red Hat Enterprise Linux or Ubuntu. Install Ceph Metadata Server daemons (ceph-mds). For details, see the Installation Guide for Red Hat Enterprise Linux or Ubuntu. This section explains two different modes of Metadata Server (MDS) daemons and how a daemon in one mode starts operating in the other mode. The active MDS daemon manages the metadata for files and directories stored on the Ceph File System. The standby MDS daemons serves as backup daemons and become active when an active MDS daemon becomes unresponsive. By default, a Ceph File System uses only one active MDS daemon. However, you can configure the file system to use multiple active MDS daemons to scale metadata performance for larger workloads. The active MDS daemons will share the metadata workload with one another dynamically when metadata load patterns change. Typically, systems with many clients benefit from multiple active MDS daemons. Note that systems with multiple active MDS daemons still require standby MDS daemons to remain highly available. When the active MDS becomes unresponsive, a Monitor will wait the number of seconds specified by the mds_beacon_grace option. Then the Monitor marks the MDS daemon as laggy and one of the standby daemons becomes active depending on the configuration. To change the value of mds_beacon_grace, add this option to the Ceph configuration file and specify the new value. Each Ceph File System has a number of ranks, one by default, which starts at zero. Ranks define the way how the metadata workload is shared between multiple Metadata Server (MDS) daemons. The number of ranks is the maximum number of MDS daemons that can be active at one time. Each MDS daemon handles a subset of the Ceph File System metadata that is assigned to that rank. Each MDS daemon initially starts without a rank. The Monitor assigns a rank to the daemon. An MDS daemon can only hold one rank at a time. Daemons only lose ranks when they are stopped. The max_mds setting controls how many ranks will be created. The actual number of ranks in the Ceph File System is only increased if a spare daemon is available to accept the new rank. Up - A rank that is assigned to an MDS daemon. Failed - A rank that is not associated with any MDS daemon. Damaged - A rank that is damaged; its metadata is corrupted or missing. Damaged ranks will not be assigned to any MDS daemons until the operators fixes the problem and uses the ceph mds repaired command on the damaged rank. This section describes various types of standby daemons configuration. Familiarize yourself with the meaning of rank in Ceph File System context. See Section 2.3, “Explanation of Ranks in Metadata Server Configuration” for details. By default, all Metadata Server daemons that do not hold a rank are standby daemons for any active daemon. However, you can configure how the MDS daemons behave in standby mode by using the following parameters in the Ceph configuration file. You can set these parameters in the Ceph configuration file on the host where the MDS daemon runs as opposed to the one on the Monitor node. The MDS daemon loads these settings when it starts and sends them to the Monitor node. When the mds_standby_replay option is set to true for a daemon, this daemon will continuously read the metadata journal of a rank associated with another MDS daemon (the up rank). This behavior gives the standby replay daemon a more recent metadata cache and makes the failover process faster if the daemon serving the rank fails. An up rank can only have one standby replay daemon assigned to it. If two daemons are both set to be standby replay then one of them becomes a normal non-replay standby daemon. If the mon_force_standby_active option is set to false, a standby replay daemon is only used as a standby for the rank that it is following. If another rank fails, the standby replay daemon will not be used as a replacement, even if no other standby daemons are available. By default, mon_force_standby_active is set to true. Each daemon has a static name that is set by the administrator when configuring the daemon for the first time. Usually, the host name of the host where the daemon runs is used as the daemon name. When setting the mds_standby_for_name option, the standby daemon only takes over a failed rank if the name of the daemon that previously held the rank matches the given name. Set the mds_standby_for_rank option to configure the standby daemon to only take over the specified rank. If another rank fails, this daemon will not replace it. If you have multiple file systems, use this option in conjunction with the mds_standby_for_fscid option to specify which file system rank you target. The File System Cluster ID (FSCID) is an integer ID specific to a Ceph File System. If the mds_standby_for_fscid option is used in conjunction with mds_standby_for_rank it only specifies which file system rank is referred to. If mds_standby_for_rank is not set, then setting mds_standby_for_fscid causes the standby daemon to target any rank in the specified FSCID. Use mds_standby_for_fscid if you want to use the standby daemon for any rank, but only within a particular file system. This section describes how to configure Metadata Sever (MDS) daemons in standby mode to better manage a failure of the active MDS daemon. Edit the Ceph configuration file. You can edit the main Ceph configuration file present on all nodes, or you can use different configuration files on each MDS node that contain just configuration related to that node. Use parameters described in Section 2.4, “Types of Standby Configuration”. This section describes how to configure multiple active Metadata Server (MDS) daemons to scale metadata performance for large systems. Do not convert all standby MDS daemons to active ones. A Ceph File System requires at least one standby MDS daemon to remain highly available. On a node with administration capabilities, set the max_mds parameter to the desired number of active MDS daemons. Note that Ceph only increases the actual number of ranks in the Ceph File Systems if a spare MDS daemon is available to take the new rank. Verify the number of active MDS daemons. This section describes how to decrease the number of active MDS daemons. The rank that you will remove must be active first, meaning that you must have the same number of MDS daemons as specified by the max_mds parameter. On a node with administration capabilities, change the max_mds parameter to the desired number of active MDS daemons. This section describes ways to limit MDS cache size. A memory limit: A new behavior introduced in the Red Hat Ceph Storage 3. Use the mds_cache_memory_limit parameters. Red Hat recommends to use memory limits instead of inode count limits. Inode count: Use the mds_cache_size parameter. By default, limiting the MDS cache by inode count is disabled. In addition, you can specify a cache reservation by using the mds_cache_reservation parameter for MDS operations. The cache reservation is limited as a percentage of the memory or inode limit and is set to 5% by default. The intent of this parameter is to have the MDS maintain an extra reserve of memory for its cache for new metadata operations to use. As a consequence, the MDS should in general operate below its memory limit because it will recall old state from clients in order to drop unused metadata in its cache. The mds_cache_reservation parameter replaces the mds_health_cache_threshold in all situations except when MDS nodes sends a health alert to the Monitors indicating the cache is too large. By default, mds_health_cache_threshold is 150% of the maximum cache size. Be aware that the cache limit is not a hard limit. Potential bugs in the CephFS client or MDS or misbehaving applications might cause the MDS to exceed its cache size. The mds_health_cache_threshold configures the cluster health warning message so that operators can investigate why the MDS cannot shrink its cache. This chapter describes how to create and mount Ceph File Systems. Create a Ceph file system on a Monitor node. See Section 3.2, “Creating the Ceph File Systems” for details. Create a client user with the correct access rights and permissions and make its key available on the node where the Ceph File System will be mounted. See Section 3.3, “Creating Ceph File System Client Users” for details. Install and configure Ceph Metadata Server daemons (ceph-mds). For details, see the the Installation Guide for Red Hat Enterprise Linux or Ubuntu and Chapter 2, Configuring Metadata Server Daemons. This section describes how to create a Ceph File System on a Monitor node. By default, you can create only one Ceph File System in the Ceph Storage Cluster. See Section 1.3, “CephFS Limitations” for details. On the Monitor node, enable the Red Hat Ceph Storage 3 Tools repository. Use the following commands from a Monitor host and as the root user. Typically, the metadata pool can start with a conservative number of PGs as it will generally have far fewer objects than the data pool. It is possible to increase the number of PGs if needed. Recommended metadata pool sizes range from 64 PGs to 512 PGs. Size the data pool proportional to the number and sizes of files you expect in the file system. Verify that one or more MDSs enter to the active state based on you configuration. Red Hat Ceph Storage 3 uses cephx for authentication, which is enabled by default. To use cephx with Ceph File System, create a user with the correct authorization capabilities on a Monitor node and make its key available on the node where the Ceph File System will be mounted. To make the key available for use with the kernel client, create a secret file on the client node with the key inside it. To make the key available for the File System in User Space (FUSE) client, copy the keyring to the client node. On a Monitor host, create a client user. Specify the client ID and desired capabilities. Do not create capabilities for the metadata pool, as Ceph File System clients do not have access to it. caps mds = "allow rw"
caps mon = "allow rw"
caps osd = "allow rw"
If you plan to use the kernel client, create a secret file using the key retrieved from the previous step. Do not include the space in between key = and the string or else mounting will not work. If you plan to use the File System in User Space (FUSE) client, copy the keyring to the client. Set the appropriate permissions for the keyring file. Clients on Linux distributions aside from Red Hat Enterprise Linux are permitted but not supported. If issues are found in the MDS or other parts of the cluster when using these clients, Red Hat will address them, but if the cause is found to be on the client side, the issue will have to be addressed by the kernel vendor. Copy the Ceph configuration file from a Monitor node to the client node. Set the appropriate permissions for the configuration file. To manually mount the Ceph File System as a kernel client, use the mount utility. A Ceph File System is created. The ceph-common package is installed. Mount the Ceph File System. To specify multiple Monitor addresses, either separate them with commas in the mount command, or configure a DNS server so that a single host name resolves to multiple IP addresses and pass that host name to the mount command. Set the user name and path to the secret file. To automatically mount a Ceph File System on start, edit the /etc/fstab file. On the client host, create a new directory for mounting the Ceph File System. In the first column, set the Monitor host names and their ports. Another way to specify multiple Monitor addresses is to configure a DNS server so that a single host name resolves to multiple IP addresses. Set the mount point in the second column and the type to ceph in the third column. Set the user name and secret file in the fourth column using the name and secretfile options, respectively. Set the _netdev option to ensure that the file system is mounted after the networking subsystem to prevent networking issues. If you do not need access time information set noatime to increase performance. The file system will be mounted on the next boot. Copy the client keyring to the client node. See Section 3.3, “Creating Ceph File System Client Users” for details. To mount a Ceph File System as a File System in User Space (FUSE) client, use the ceph-fuse utility. On the node where the Ceph File System will be mounted, install the ceph-fuse package. Create a directory to serve as a mount point. Note that if you used the path option with MDS capabilities, the mount point must be within what is specified by path. Use the ceph-fuse utility to mount the Ceph File System. Consider to mount the file system manually first. See Section 3.4.2, “Manually Mounting the Ceph File System as a kernel Client” for details. Ceph File Systems (CephFS) backed by erasure-coded pools use less overall storage compared to Ceph File Systems backed by replicated pools. While erasure-coded pools use less overall storage, they also use more memory and processor resources than replicated pools. Ceph File Systems on erasure-coded pools are a Technology Preview. For more information see Erasure Coding with Overwrites (Technology Preview). Ceph File Systems on erasure-coded pools require pools using the BlueStore object store. For more information see Erasure Coding with Overwrites (Technology Preview). Verify that one or more MDSs enter the active state based on you configuration. See the Erasure-Coded Pools section in the Red Hat Ceph Storage Storage Strategies Guide for more information. See the Erasure Coding with Overwrites section in the Red Hat Ceph Storage Storage Strategies Guide for more information. This chapter describes common Ceph File System administrative tasks. To map a directory to a particular MDS rank, see Section 4.2, “Mapping Directory Trees to MDS Ranks”. To disassociate a directory from a MDS rank, see Section 4.3, “Disassociating Directory Trees from MDS Ranks”. To work with files and directory layouts, see Section 4.4, “Working with File and Directory Layouts”. To add a new data pool, see Section 4.5, “Adding Data Pools”. To remove a Ceph File System, see Section 4.6, “Removing Ceph File Systems”. Install and configure Ceph Metadata Server daemons (ceph-mds). For details, see the Installation Guide for Red Hat Enterprise Linux or Ubuntu Chapter 2, Configuring Metadata Server Daemons. Create and mount the Ceph File System. For details, see Chapter 3, Deploying Ceph File Systems. This section describes how to map a directory and its subdirectories to a particular active Metadata Server (MDS) rank so that its metadata is only managed by the MDS daemon holding that rank. This approach enables you to evenly spread application load or limit impact of users' metadata requests to the entire cluster. Note that an internal balancer already dynamically spreads the application load. Therefore, map directory trees to ranks only for certain carefully chosen applications. In addition, when a directory is mapped to a rank, the balancer cannot split it. Consequently, a large number of operations within the mapped directory can overload the rank and the MDS daemon that manages it. Configure multiple active MDS daemons. See Section 2.6, “Configuring Multiple Active Metadata Server Daemons” for details. Ensure that the attr package is installed on the client node with mounted Ceph File System. Set the ceph.dir.pin extended attribute on a directory. This section describes how to disassociate a directory from a particular active Metadata Server (MDS) rank. Set the ceph.dir.pin extended attribute to -1 on a directory. Note that any separately mapped subdirectories of /home/ceph-user/ are not affected. Make sure that the attr package is installed. This section explains what file and directory layouts are in the context for the Ceph File System. A layout of a file or directory controls how its content is mapped to Ceph RADOS objects. The directory layouts serves primarily for setting an inherited layout for new files in that directory. See Layouts Inheritance for more details. The File and Directory Layout Fields table lists available layout fields that you can set on files and directories. ID or name of the pool to store file’s data objects. Note that the pool must part of the set of data pools of the Ceph file system. See Section 4.5, “Adding Data Pools” for details. Namespace to write objects to. Empty by default, that means the default namespace is used. The size in bytes of a block of data used in the RAID 0 distribution of a file. All stripe units for a file have equal size. The last stripe unit is typically incomplete. That means it represents the data at the end of the file as well as unused space beyond it up to the end of the fixed stripe unit size. The number of consecutive stripe units that constitute a RAID 0 “stripe” of file data. Size of RADOS objects in bytes in which file data are chunked. Files inherit the layout of their parent directory when you create them. However, subsequent changes to the parent directory layout do not affect children. If a directory does not have any layouts set, files inherit the layout from the closest directory with layout in the directory structure. Use the setfattr command to set layout fields on a file or directory. When you modify the layout fields of a file, the file must be empty, otherwise an error occurs. <field> with the name of the field, see the File and Directory Layouts Fields table for details. This section describes how to use the getfattr command to view layout fields on a file or directory. Directories do not have an explicit layout until you set it (see Section 4.4.3, “Setting File and Directory Layouts”). Consequently, an attempt to view the layout fails if you never modified the layout. When viewing the pool field, the pool is usually indicated by its name. However, when you just created the pool, it can be indicated by its ID. This section describes how to use the setfattr command to remove layouts from a directory. When you set a file layout, you cannot change or remove it. The pool_namespace field is the only field you can remove separately. Before using another data pool in the Ceph File System, you must add it as described in this section. By default, for storing file data, CephFS uses the initial data pool that was specified during its creation. To use a secondary data pool, you must also configure a part of the file system hierarchy to store file data in that pool (and optionally, within a namespace of that pool) using file and directory layouts. See Section 4.4, “Working with File and Directory Layouts” for details. Create a new data pool. Add the newly created pool under the control of the Metadata Servers. If you use the cephx authentication, make sure that clients can access the new pool. See Section 3.3, “Creating Ceph File System Client Users” for details. As a storage administrator, you can remove a Ceph File System (CephFS). Before doing so, consider backing up all the data and verifying that all clients have unmounted the file system locally. This operation is destructive and will make the data stored on the Ceph File System permanently inaccessible. Access as the root user to a Ceph Monitor node. Display the status of the Ceph File System. Fail all MDS ranks shown in the status. Remove the Ceph File System. Verify that the file system has been successfully removed. Optional. Remove data and metadata pools associated with the removed file system. See the Delete a pool section in the Red Hat Ceph Storage 3 Storage Strategies Guide. This chapter describes how to unmount Ceph File System mounted as kernel or File System in User Space (FUSE) clients. This section shows how to unmount a Ceph File System that is mounted as a kernel client. This section shows how to unmount a Ceph File System that is mounted as a File System in User Space (FUSE) client. The Ceph monitor daemons generate health messages in response to certain states of the MDS cluster. Below is the list of the cluster health messages and their explanation. One or more MDS ranks are not currently assigned to any MDS daemon. The cluster will not recover until a suitable replacement daemon starts. One or more MDS ranks has encountered severe damage to its stored metadata, and cannot start again until the metadata is repaired. One or more MDS ranks are not currently up and running, clients might pause metadata I/O until this situation is resolved. This includes ranks being failed or damaged, and additionally includes ranks which are running on an MDS but are not in the active state yet, for example ranks in the replay state. The MDS daemons are supposed to send beacon messages to the monitor in an interval specified by the mds_beacon_interval option (default is 4 seconds). If an MDS daemon fails to send a message within the time specified by the mds_beacon_grace option (default is 15 seconds), the Ceph monitor marks the MDS daemon as laggy and automatically replaces it with a standby daemon if any is available. The MDS daemons can identify a variety of unwanted conditions, and return them in the output of the ceph status command. This conditions have human readable messages, and additionally a unique code starting MDS_HEALTH which appears in JSON output. Below is the list of the daemon messages, their codes and explanation. CephFS maintains a metadata journal that is divided into log segments. The length of journal (in number of segments) is controlled by the mds_log_max_segments setting. When the number of segments exceeds that setting, the MDS starts writing back metadata so that it can remove (trim) the oldest segments. If this process is too slow, or a software bug is preventing trimming, then this health message appears. The threshold for this message to appear is for the number of segments to be double mds_log_max_segments. "Client <name> failing to respond to capability release"
CephFS clients are issued capabilities by the MDS. The capabilities work like locks. Sometimes, for example when another client needs access, the MDS requests clients to release their capabilities. If the client is unresponsive, it might fail to do so promptly or fail to do so at all. This message appears if a client has taken a longer time to comply than the time specified by the mds_revoke_cap_timeout option (default is 60 seconds). "Client <name> failing to respond to cache pressure"
Clients maintain a metadata cache. Items, such as inodes, in the client cache are also pinned in the MDS cache. When the MDS needs to shrink its cache to stay within its own cache size limits, the MDS sends messages to clients to shrink their caches too. If a client is unresponsive, it can prevent the MDS from properly staying within its cache size and the MDS might eventually run out of memory and terminate unexpectedly. This message appears if a client has taken more time to comply than the time specified by the mds_recall_state_timeout option (default is 60 seconds). See Section 2.8, “Understanding MDS Cache Size Limits” for details. "Client name failing to advance its oldest client/flush tid"
The CephFS protocol for communicating between clients and MDS servers uses a field called oldest tid to inform the MDS of which client requests are fully complete so that the MDS can forget about them. If an unresponsive client is failing to advance this field, the MDS might be prevented from properly cleaning up resources used by client requests. This message appears if a client have more requests than the number specified by the max_completed_requests option (default is 100000) that are complete on the MDS side but have not yet been accounted for in the client’s oldest tid value. Corrupt or missing metadata was encountered when reading from the metadata pool. This message indicates that the damage was sufficiently isolated for the MDS to continue operating, although client accesses to the damaged subtree return I/O errors. Use the damage ls administration socket command to view details on the damage. This message appears as soon as any damage is encountered. If it encounters a write error while writing to the metadata pool. If the administrator forces the MDS to enter into read-only mode by using the force_readonly administration socket command. "<N> slow requests are blocked"
One or more client requests have not been completed promptly, indicating that the MDS is either running very slowly, or encountering a bug. Use the ops administration socket command to list outstanding metadata operations. This message appears if any client requests have taken longer time than the value specified by the mds_op_complaint_time option (default is 30 seconds). ""Too many inodes in cache"
The MDS has failed to trim its cache to comply with the limit set by the administrator. If the MDS cache becomes too large, the daemon might exhaust available memory and terminate unexpectedly. This message appears if the MDS cache size is 50% greater than its limit (by default). See Section 2.8, “Understanding MDS Cache Size Limits” for details. If set to true, monitors force MDS in standby replay mode to be active. Set under the [mon] or [global] section in the Ceph configuration file. The number of active MDS daemons during cluster creation. Set under the [mon] or [global] section in the Ceph configuration file. The memory limit the MDS enforces for its cache. Red Hat recommends to use this parameter instead of the mds cache size parameter. The cache reservation (memory or inodes) for the MDS cache to maintain. The value is a percentage of the maximum cache configured. Once the MDS begins dipping into its reservation, it recalls client state until its cache size shrinks to restore the reservation. The number of inodes to cache. A value of 0 indicates an unlimited number. Red Hat recommends to use the mds_cache_memory_limit to limit the amount of memory the MDS cache uses. The fraction of directory contains erroneous information before Ceph commits using a full update (instead of partial update). The maximum size of a directory update before Ceph breaks the directory into smaller transactions (in MB). The blacklist duration for failed MDS daemons in the OSD map. The minimum interval (in seconds) to try to avoid propagating recursive statistics up the tree. How quickly changes in directory statistics propagate up. Determines whether the MDS allows clients to see request results before they commit to the journal. Determines whether the MDS tries to skip corrupt journal events during journal replay. The maximum events in the journal before Ceph initiates trimming. Set to -1 to disable limits. The maximum number of segments (objects) in the journal before Ceph initiates trimming. Set to -1 to disable limits. The maximum number of segments to expire in parallels. The frequency (in seconds) of workload exchanges between MDS nodes. The number of iterations to run balancer before Ceph stops. Used for testing purposes only. The number of seconds to run balancer before Ceph stops. Used for testing purposes only. The maximum number of balancer iterations before Ceph removes an old MDS target from the MDS map. The journal poll interval when in standby-replay mode (hot standby). Ceph will dump the MDS cache contents to a file on each MDS map. Ceph will dump MDS cache contents to a file after rejoining the cache during recovery. Ceph will assert that various scatter/gather invariants are true (for developers only). Ceph will assert that various recursive statistics invariants are true (for developers only). Ceph will verify directory fragmentation invariants when convenient (for developers only). The debug authentication pin invariants (for developers only). Ceph will inject MDS failure in MDS Table code (for developers only). Ceph will delete inode preallocation metadata on startup (for testing only). The MDS daemon will standby for another MDS daemon of the name specified in this setting. An instance of the MDS daemon will be standby for another MDS daemon instance of this rank. Determines whether the MDS daemon polls and replays the log of an active MDS (hot standby). Allow an entry to span a stripe boundary. How frequently to update the journal head object. How many stripe periods to read ahead on journal replay. How many stripe periods to zero ahead of write position. Maximum additional latency in seconds to incur artificially. Maximum bytes that will be delayed flushing. This section lists configuration options for CephFS FUSE clients. Set them in the Ceph configuration file under the [client] section. Set the ACL type. Currently, only possible value is posix_acl to enable POSIX ACL, or an empty string. This option only takes effect when the fuse_default_permissions is set to false. Set the client cache midpoint. The midpoint splits the least recently used lists into a hot and warm list. Set the number of inodes that the client keeps in the metadata cache. Set the delay between capability releases in seconds. The delay sets how many seconds a client waits to release capabilities that it no longer needs in case the capabilities are needed for another user space operation. If set to true, clients read data directly from OSDs instead of using a local page cache. If set to true, use the recursive size of a directory (that is, total of all descendants). Set the maximum size of inlined data stored in a file inode rather than in a separate data object in RADOS. This setting only applies if the inline_data flag is set on the MDS map. Comma-delimited strings for client metadata sent to each MDS, in addition to the automatically generated version, host name, and other metadata. Set the group ID of CephFS mount. Set the timeout for CephFS mount in seconds. Set the user ID of CephFS mount. Set the maximum number of dirty bytes in the object cache. Set the maximum age in seconds of dirty data in the object cache before writeback. Set the maximum number of objects in the object cache. Set how many bytes of data will the client cache. Set the target size of dirty data. Red Hat recommends to keep this number low. Check client permissions on all I/O operations. Report root directory quota for the statfs operation. Set the maximum number of bytes that the kernel reads ahead for future read operations. Overridden by the client_readahead_max_periods setting. Set the number of file layout periods (object size * number of stripes) that the kernel reads ahead. Overrides the client_readahead_max_bytes setting. Set the minimum number bytes that the kernel reads ahead. Set the snapshot directory name. Set the interval in seconds between capability renewal and other upkeep. Choose random MDS for each request. When set to false, the ceph-fuse utility checks does its own permissions checking, instead of relying on the permissions enforcement in FUSE. Set to false together with the client acl type=posix_acl option to enable POSIX ACL. These options are internal. They are listed here only to complete the list of options. Check if the reply from the MDS contains required capabilities. Add artificial delay between client ticks. The path to the trace file for all file operations. The output is designed to be used by the Ceph synthetic client. See the ceph-syn(8) manual page for details.